I made a quilt for a friend of mine at work who is having a little girl. I made the quilt top in one evening and quilted it the next evening. Then I went to start binding it. 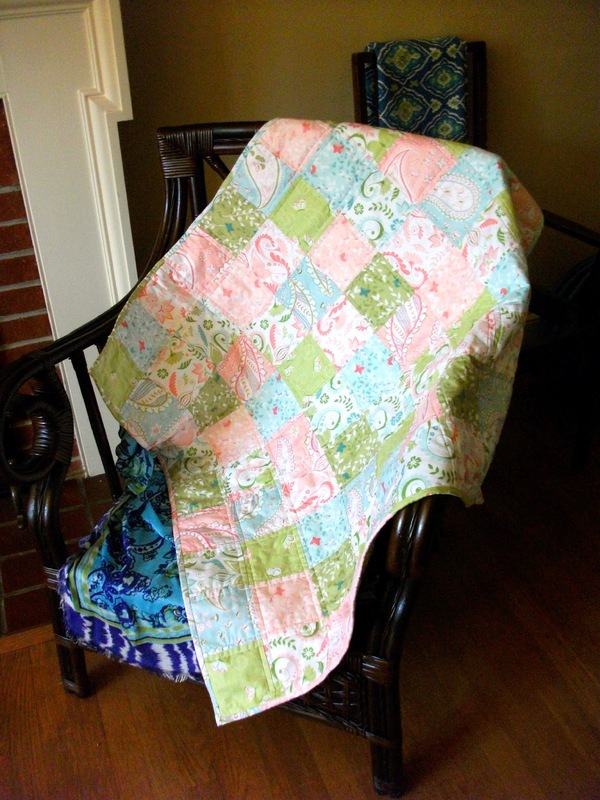 So I've bound a few quilts in my day, but I'll be honest, it's been a little while. Apparently I'd forgotten how wide I usually cut my binding strips. You can see where this is going. 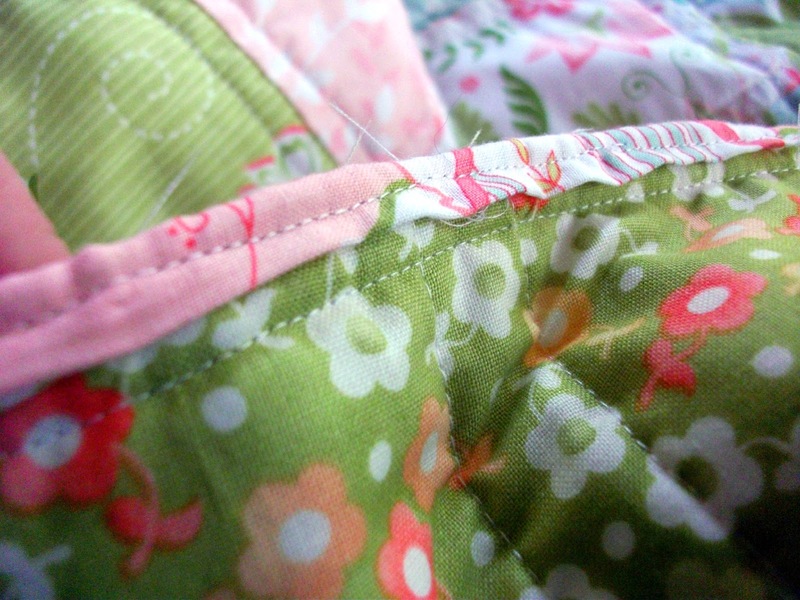 My binding barely covered the edge of the quilt on the back side. and in some places the edge of the backing was peeking out of the binding. To make matters worse, I somehow thought that machine stitching the binding, instead of the usual hand whip stitching, would help. You can see how the stitching on the binding left this little floppy edge. And this stretch wasn't even the worst. You can see another line of stitching below the binding where I had already attached another line of (correctly sized) binding. Which I turned and stitched by hand. Why do I always make things harder than necessary? But in all, it turned out well. Lessons learned, etc. I'll never forget to check my binding width again! I haven't even attempted to do machine finished binding for that reason! I'm actually not sure what the backing is, it's just something from my LQS that matched really well. The blocks are Bella Butterfly - I'm glad you like it! 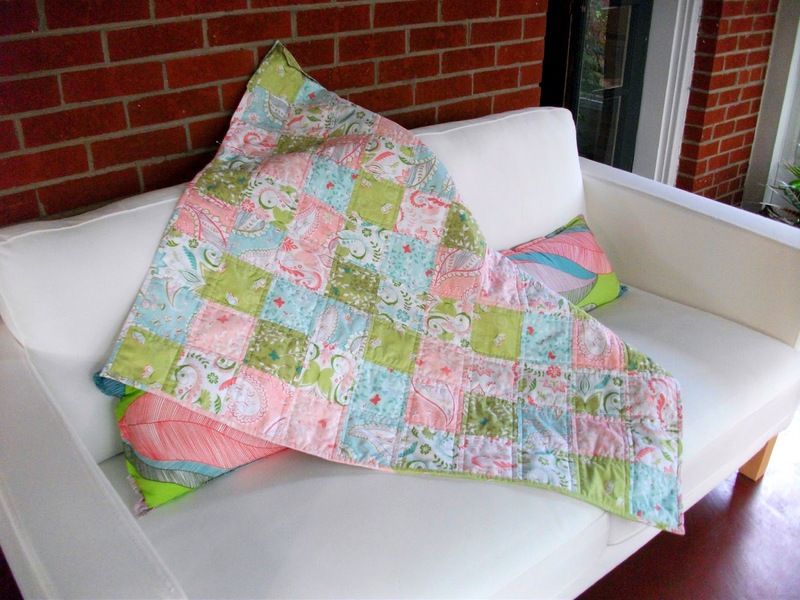 Machine quilting! Yeah, I did that!